— 2016 Movie "The Big Short" where Michael Burry was featured as one of the four investors who predicted the credit and housing bubble collapse in 2008. 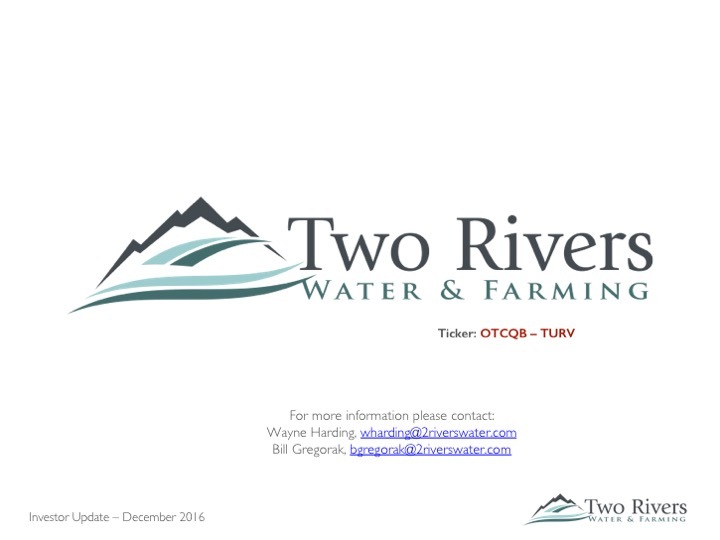 [CHERYL] Welcome everyone to Two Rivers Water & Farming Company investor update call being held on December 7, 2017 at 2:30 pm MST. This investor update call is being recorded. The recording will be posted to 2riverswater.com/investors within a day or two of this session. After today’s presentation, there will be an opportunity to ask questions. You will be notified when the presentation is completed. Since this is a less structured investor call compared to an earnings call, people asking a question will not go through an operator, but rather all attendees will have an open mic. We request that you place yourself on mute until you want to ask a question. After the question is asked, please place yourself back on mute. Before we begin the formal presentation today, I would like to make the following announcement. Except for historical information presented, statements made during this conference call are forward-looking. These forward-looking statements include expectations related to factors including, but not limited to, revenue, expenses, earnings, and new and existing business initiatives. Investors are cautioned that all forward-looking statements involve risks and uncertainties. Several factors can cause results to differ materially from those in the forward-looking statements. A complete listing of these forward-looking statements is included in Two Rivers’ most current 10K on file with the SEC. Again, I would like to remind attendees that this investor update call is being recorded. The recording will be posted to the Two Rivers website in the investor section. Now I would like to turn the call over to Two Rivers’ Chief Executive Officer, Wayne Harding. Please go ahead. Provide you a brief history of Two Rivers. Perhaps this will be a refresher for some of you, but I believe this will help put our future plans into perspective. I’ll also provide a brief analysis on what I think we’ve done right and where we need to improve. Provide you the current status on our business – specifically discussing GrowCo Inc and Water Redevelopment Company which we formed as a new subsidiary this year. Provide you information concerning our future strategy and what it means to you. Two Rivers became publicly traded in 2006 under the name Navidec Financial Services. Navidec was formed through a reverse merger with an oil and gas company that subsequently traded on the NYSE. Initial capital to Navidec from this reverse merger was approximately $12 million, most of which was generated in 2008. I joined Navidec in mid 2008 and by September 2009, became its CFO. With this capital, Navidec began looking for the next big thing. We decided that water was the future of core value and opportunity for our investors. 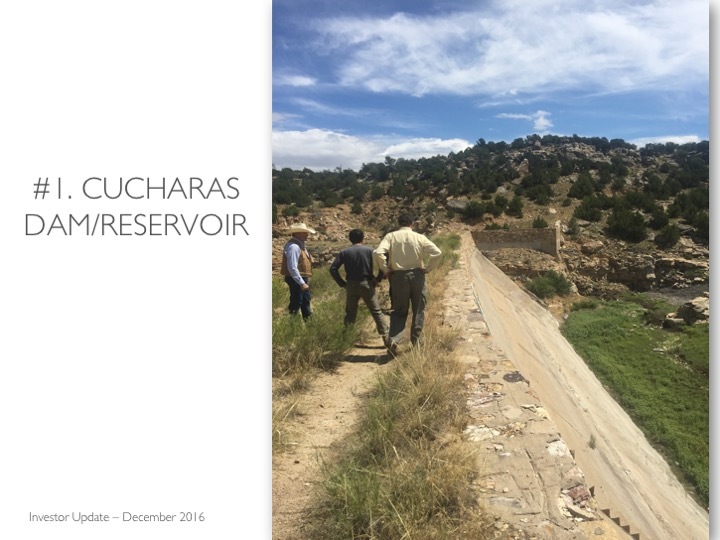 In 2009, we began acquiring water assets through our 95% purchase of the Huerfano Cucharas Irrigation Company. During that year we changed our name from Navidec Financial Services to Two Rivers Water Company, and subsequently added “Farming” to our name, since we acquired a farming operation in 2012. Also occurring in late 2012, Colorado became one of the first states to approve recreational marijuana to become effective January 1, 2014. We saw an opportunity to utilize some of our land and water assets within this new industry. 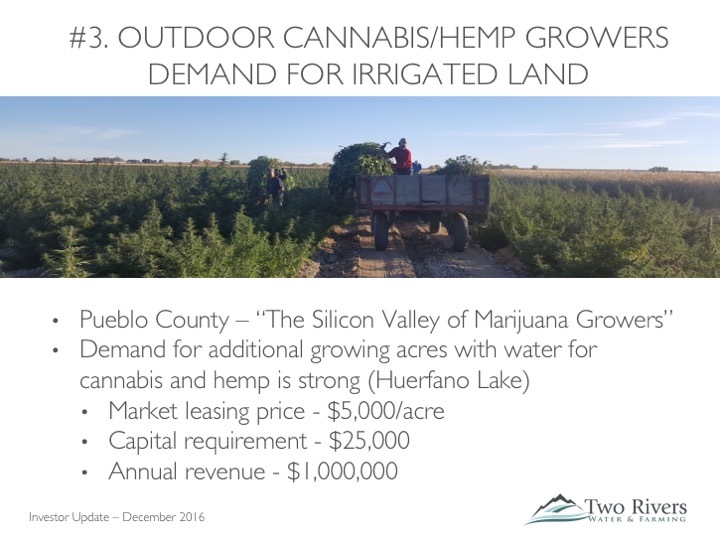 So in early 2014, Two Rivers formed GrowCo to provide state of the art greenhouse infrastructure to marijuana growers, both medical and recreational. We transferred 160 acres of land and associated water rights to GrowCo, had several rounds of capital raises in order to construct our first greenhouse and provide capital to a second greenhouse, which is in process. We have had a number of misteps with our first greenhouse. The first tenant, Suncanna, took possession in the Fall of 2015, never paid its rent, and consequently GrowCo Partners 1, LLC, which we refer to as GCP1, the owner of the first greenhouse, obtained possession in September of 2016. Anticipating this possession, in August 2016, GCP1 entered into a new lease agreement before possession with a new entity, Johnny Cannaseed, which is partially owned by Two Rivers’ prior CEO, John McKowen. John McKowen resigned at the end of May 2016 to avoid conflicts of interest and focus on becoming the tenant for GrowCo’s greenhouses. Johnny Cannaseed was unable to obtain the necessary marijuana grow licenses, so, with the permission of the GCP1 board, it sub-let the greenhouse to 2 licensed growers. After a solid start from both sub-tenants, there have been issues. One sub-tenant suffered through a crop reduction due to infestation. The other sub-tenant has yet to pay their rent, and it appears that Johnny Cannaseed will proceed with an eviction for the second sub-tenant. The first sub-tenant is now on track and is producing revenue. Johnny Cannaseed, as of the beginning of this month, owed $1,294,000 in back due rent, deposit and share of expenses under the triple net lease. The GCP1 board has been working with Johnny Cannaseed to formulate a plan to get caught up on rent payments. As of Monday this week, an agreement was reached that will get rent payments current within 4 months, assuming no further negative issues occur. 10,000,000 in escrow for the benefit of Two Rivers Water & Farming shareholders during 4 record dates in 2015. 10,000,000 shares owned by McGrow, LLC. McGrow provides services to GrowCo greenhouse tenants. The only relationship between McGrow and Two Rivers is John McKowen. Mr. McKowen is the largest shareholder of Two Rivers and also owns membership units in McGrow. Approximately 5,000,000 shares owned by a variety of investors. In October 2017, John McKowen was elected to the GrowCo board and shortly after that, appointed as GrowCo’s CEO. Due to the addition of John McKowen to the GrowCo board and election as CEO, Two Rivers is currently performing an examination of the Variable Interest Entity accounting rules and will determine before year end if it should continue to fully consolidate GrowCo. Based on our research to date, it is our preliminary findings that GrowCo should not be consolidated with our financial results going forward. However, keep in mind that this is still preliminary. If that is the conclusion that is drawn and is agreed to by our auditors, we will begin accounting for our ownership share in GrowCo and GCP1 by the equity method for 2017. We are hopeful that GrowCo will become a separate, publicly traded company within the next 18 to 24 months. Once an effective registration statement is filed for the 10,000,000 GrowCo shares held in escrow for the benefit of the Two Rivers shareholders at the 2015 record dates, the escrow shares will be distributed on a pro-rata basis. Before we turn the discussion to our current main focus – Water Redevelopment Company, I want to discuss another investment that didn’t work out for us – Dionisio Farms and Produce, which we internally refer to as DFP. We were unable to reach economies of scale and work with trustworthy people in our farm operations. This gave rise to a loss of approximately $500,000 in each of the last 3 years (2014, 2015 and 2016). Therefore the executive team here at Two Rivers in consultation with our Board decided to dispose of DFP in the fourth quarter of 2016. We have sold all of the assets, both land and equipment, associated with our farming operations and the wind down is nearly complete. OK – now our water focus. At our last investor update teleconferenece, we announced the formation of Water Redevelopment Company, which we refer to as Water Redev. 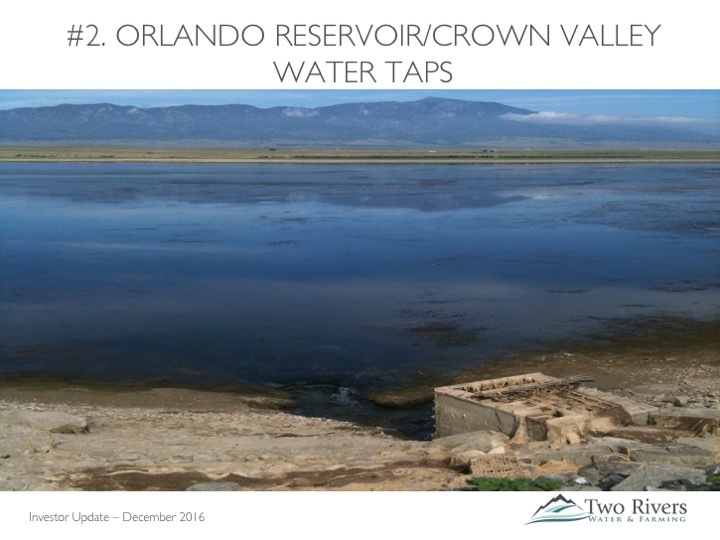 As a refresher – why did Two Rivers form Water Redev? For far too long Two Rivers has not focused on our #1 asset, and probably why many investors first became excited about our Company - WATER. Our December 31, 2016 financials show $48 million in total assets and $32 million in water assets. The most water revenue we have shown on our yearly financials is $40,000 in 2013. Imagine, owning an asset such as water, or any asset, worth $32 million and only earn $40,000 in yearly revenue. We intend to change this revenue and asset management picture. How? First a bit about water. Water is probably mankind’s most precious resource. Well, perhaps air comes before water, but that’s it. Water Redev has all of the above, with the exception of water equipment. 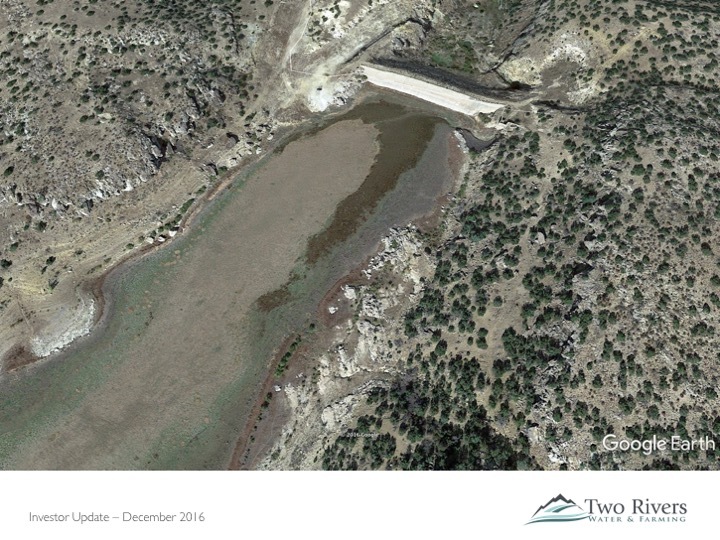 Cucharas Reservoir – We will tear down and rebuild the dam, but with an investment of $33 million, we will have a new dam with about 35,000 acre feet of storage. After this investment the dam valuation will be approximately $175 million. We can use this dam to store our water, store water for others, assist with water supply to the Crown Valley metro district, among other revenue generating activites. Huerfano Lake – Minimal expense is required to provide water from this storage container to ag users in the Pueblo county area via yearly water leases. We are already in talks with a few outdoor hemp and marijuana growers to lease water from us. The rates discussed are in excess of $1,000 per acre foot per year. Crown Valley – we recently expanded our water supply agreement with Crown Valley from 10,000 to 20,000 water taps. Each tap is sold to Crown Valley for $6,500. So this means at 20,000 taps, this represents a $130,000,000 revenue opportunity to Water Redev. It will take many, many years and additional development dollars to fulfill the total contract. In our revenue projections, to be discussed soon, we have projected a very conservative sell through of taps. Crop share arrangement with hemp grower. We have ideal farmland in Huerfano county Colorado with senior water rights. We believe in the value of hemp, especially on the “CBD” oil focused on medical uses. We have signed a crop share agreement with a hemp growing entity for 2018 production on 4 to 6 acres. We want to do this as test and then, if successful, rapidly expand our planted acreage. If this test is successful, we can increase hemp production substantially. So what does this all mean to our top line? Water should begin to generate revenue in later 2018. We anticipate $300,000 then, growing to $2.9 million in 2019. The revenue really kicks in once the Cucharas dam rehabilitation is completed in 2022. In that year we are targeting close to $10 million top line. Once the current Water Redev capital raise is completed, we are planning to work with a wall street, NYSE member firm for an initial offering, which could be accomplished under the JOBS act, Regulation A Plus. What about valuation? I draw your attention to 2 like water companies both trading on NASDAQ: PureCycle and Cadiz. Both reported last year’s revenue at mid $400,000 and their market capitalization is around $200 million. I think the best way to value these water companies, for the time being, is not on a multiple of revenue but total assets to market capitalization. Doing this, gives a market value to Water Redevelopment at approximately $100 million. Presently, the shareholders of Two Rivers own 97% of Water Redevelopment. After all capital raises, we anticipate that our shareholders will still own the majority of Water Redev. I will now pass the baton to Bill Gregorak, our CFO, to review our past performance. He will then turn it back to me to monitor Q&A. Bill – it’s all yours. [BILL] Thank you, Wayne. On November 13 we filed the September 30, 2017 10Q with the SEC. I’ll review the most important points from both the quarter and our year-to-date results. Revenue for the third quarter was just over $1M, with all but $16,000 due to leasing income from GrowCo’s first greenhouse, GCP1. Compared to the quarter ended June 30, 2017 that is down just over $300,000. The reason for the decline was that the sub-tenants were still new to the facility in the first quarter of 2017 so we made the decision to defer some of the revenue earned in the first quarter until the sub-tenants were completely in production. This amount was subsequently recognized in the second quarter. The amount of revenue recognized in the third quarter represents the ongoing revenue for a fully occupied GCP1. Revenue for the first nine months of 2017 was $2.9M with all but $40,000 coming from GCP1 leases. Total operating expenses for the third quarter was $719,000, which is up $422,000 from the second quarter and up $56,000 from the same quarter in 2016. The bulk of the increase from the prior quarter was due to the non-cash expensing of annual stock option awards for directors and employees. The remaining increases were spread amongst several items with legal expenses the largest quarter over quarter increase at $64,000. 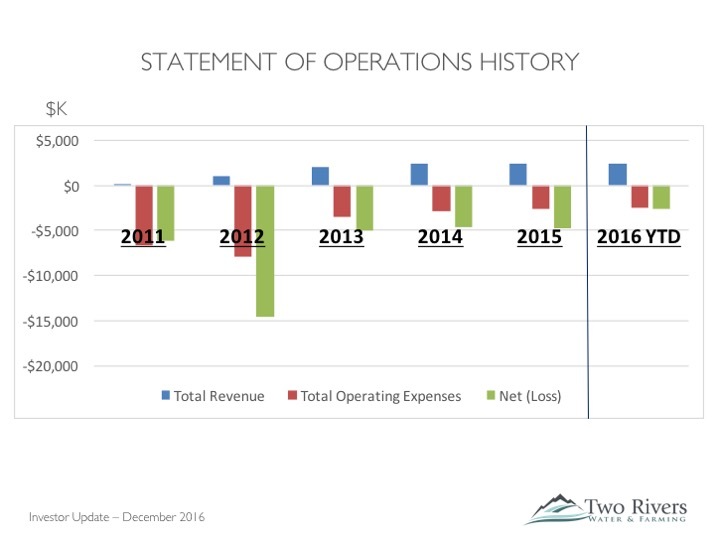 Total operating expenses for the first nine months of 2017 was $1.5M, a decrease of $1.3M from the prior year. Operating profit for the third quarter was $303,000, a $741,000 decline from the prior quarter due to the previously mentioned reduction in leasing revenue and higher operating expenses. Operating profit for the first nine months of 2017 is $1.4M, a substantial improvement from the $2.8M loss for the first nine months of 2016. Other expenses were $882,000 for the third quarter of 2017 compared to $534,000 in the second quarter of 2017 and $455,000 in the third quarter of 2016. During the second quarter of 2017, other expenses were reduced by a gain of $152,000 on the sale of assets. Interest expense was flat from Q2 to Q3 2017, but increased by $254,000 from Q3 2016 due primarily to new GrowCo loans during the last year. Warrant expense of $93,000 was the other factor contributing to the increase in the third quarter this year. Loss from Discontinued Operations was $92,000 for the third quarter of 2017 and $1.2M year to date. Most of our winding down of the DFP farming operations have been completed. After deducting losses from non-controlling interest and preferred shareholder distributions the Net Loss Attributable to Common Shareholders for the third quarter of 2017 was $962,000 or $0.03 per share, compared to a loss of $1.7M for the same period in 2016 or $0.06 per share. Year to Date the Net Loss is $3.1M or $0.10 per share, down by more than 50% from $6.3M or $0.22 per share through three quarters in 2016. I’ll now turn it back to Wayne. Please place your call on mute until you ask a question. If asking a question, please state your name and then the question. In summary, I want to thank our current and past investors. I know at times that there is frustration, especially about lack of progress or misques in the past. We are focused on changing this, fulfilling commitments and increasing the overall value of Two Rivers. We believe with the shoring up of cash flow from GCP1, the possible opening up of a second greenhouse in the near future, GrowCo will yield benefits to our shareholders. We are excited about Water Redev. Keep in mind that this will require capital, but we are making good progress in this area. It is also a longer term play, but we side a bright upside.